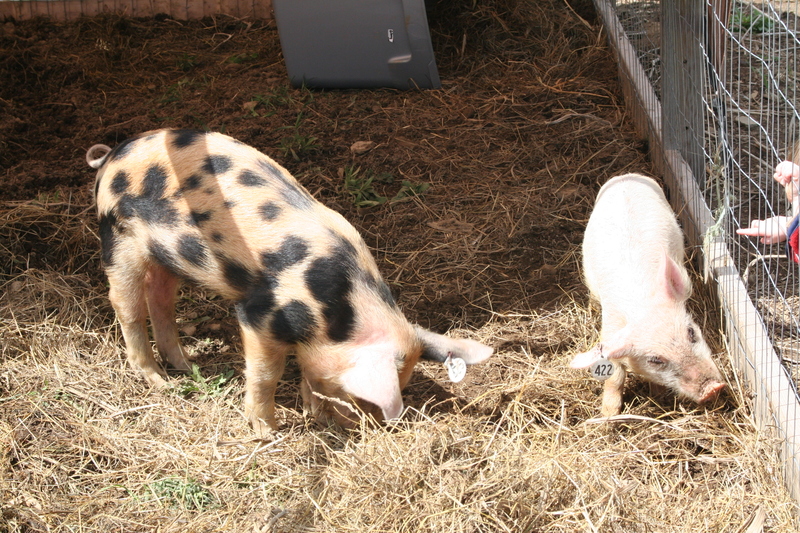 One (castrated) male and one female from the same litter of yorkshire/old spot pigs (mostly to be able to compare the bacon on a male vs. a female). I noticed a small bit of that “pig” odor in the bacon, but nowhere near the amount I had on our first pig. Male vs. female made no difference in smell to me- both had a faint smell- on the fat in the inner cavity only. Because my husband and dad found it easier to gut the female vs. the male, I’ll probably stick to raising just females in the future. Regarding raising pigs this year, I tried a little something different. Feed consisted of scraps and a fresh spot of pasture in the am and hog feed in the pm. We used 1300 lbs of feed on 2 pigs for about 6 months in the pig tractor. The last 2 months relied more heavily on grain both am and pm since vegetation was limited and the pigs were much larger. The drawback: The pigs acted like they were starving (although they were not really) at all meals- very loud, and no way was I going to step in that pen unless the feed was in the pan! The pig tractor still worked well, but is in need of some repairs before next year. 2 corners have pulled apart at the bottom of the framing (probably from the lift and shift method of moving, since the wheels are still not installed). The wire is a little more bent, but still useable. The tarp I have to replace every year, and usually needs a fix part way through the summer and reinforcement in the fall. I’ve still had no one escape under the tractor, but one pig jumped out 3 times this year- always only as I was bringing feed. I put barbed wire on 3 sides of the pen to keep them from jumping up, and that worked until there was a hole in the tarp and it jumped through there once. The male was larger until the last 1 1/2 months or so, then the female grew significantly larger. I didn’t tape just before butchering. We also didn’t check hanging weight (we don’t have a proper scale for that). Thanksgiving day was the start of our processing. I DO have weights for what we ended up with in the fridge/freezer. No skin, fairly well trimmed of fat, and the only bones included in this weight were ribs and some bone in chops- “hams” were de-boned, I didn’t use any organs, head, or feet, and no lard weight is counted. 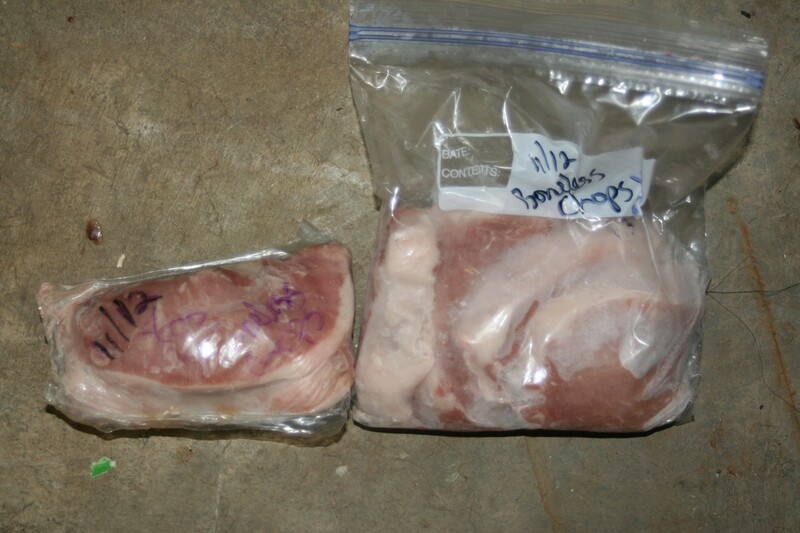 The female pig yielded 125 lbs in the freezer, The male 100 lbs. Day 1: Butchering (gutting and skinning) took about half of the day- then the pigs were wrapped in a sheet and hung in the garage. Day 2: Both pigs were cut up (My husband uses his sawz-all to cut it into big chunks, the remaining cutting is done inside). We packaged chops, loins, and ribs immediately and chunked everything up to be ground for sausage. the “hams” and other suitable larger chunks for brined roasts were set aside. Day 3: All the sausage was ground. We’ve got a small grinder my husband had for deer and we’ve got access to a larger grinder from family (that works 3x as fast). It took a solid evening to double grind our 100 lbs of ground pork. 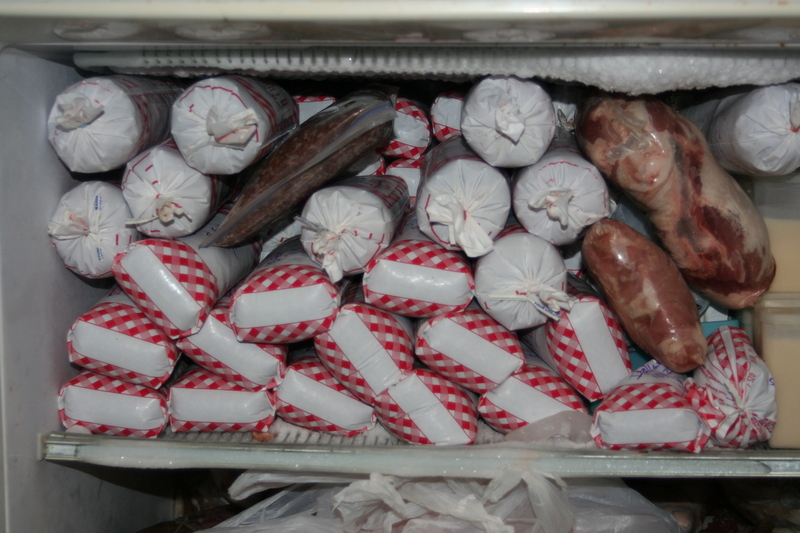 We packaged most of it (using mainly ground meat bags) in 1 1/2 lb. portions. We also made up 45 lbs of breakfast sausage, about 15 lbs of Italian sausage, and have about 15 lbs left in the fridge to be finished into something or packaged. Day 4: I spent several hours in the morning brining roasts/hams and rubbing bacon with cure. The brine is the same as previously used. The bacon is based on last years recipes- some is just a simple brown sugar and salt mixture. Some has the addition of maple flavoring. I’m solely using the ziplock method- no dry rubs this year. Day 5: (after brining and bacon curing is done)- packaging and some slicing of brined roasts and bacon. If we had pushed hard to do it all, it would have been done (except for packaging the bacon and brined roasts) in 2 solid days. For packaging this year, we wanted to try something more substantial than ziplocks for longer than 6 months of storage. I purchased shrink bags (we used some in our first chicken processing venture this fall) in 6×11,7×14, and 11×16 sizes. I had picked up a heat bar sealer (Dazey seal-a-meal) at a yard sale. That worked fairly well to seal the tops of bags- if it was wiped clean inside. There’s also a bit of a learning curve. THe longer it’s on, the hotter it gets, so you have to be quick on the seal or it melts a hole in the bag. But if it’s too cool, it won’t seal. As long as there’s head room, a twist tie or zip tie will suffice on the shrink bags. For bone edges, I cut up a white t-shirt to use for bone pads. Bacon was shrink wrapped in 1-2lb chunks and we’ll slice it as we open it to use- so it keeps better. Once packaged, a small slit is made in the bag, then it’s dipped in a pot of hot water (170-190 ish) for a couple seconds. I used my jar lifter for canning, but you can also use a dip basket. There is some bubbling/splattering as the air escapes the bag as it shrinks. Then dry, put a piece of tape or a freezer safe label over the hole, and label it for the freezer. Even if it gets a hole, it doesn’t open back up to allow air exposure to as much surface area of the meat. It’s user friendly, requires little for extra materials, and is reasonably priced in comparison to freezer paper, vacuum packaging or even ziplocks (depending on where you buy and in what quantity). 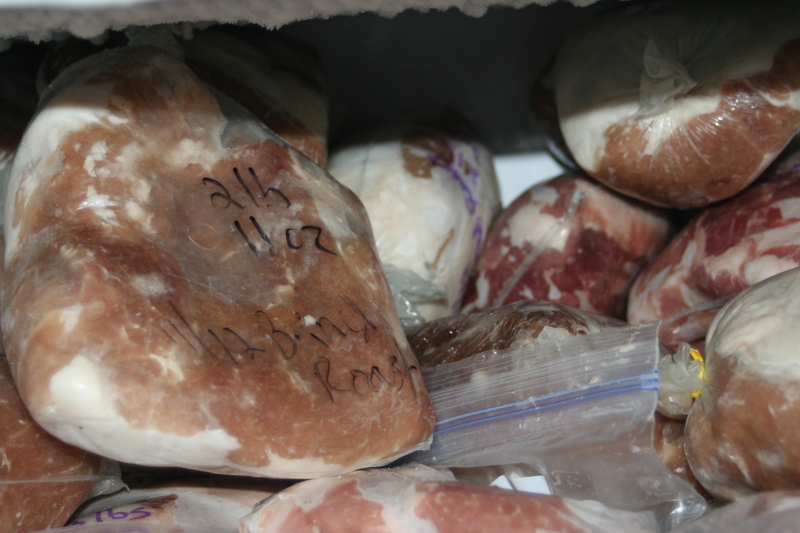 We packaged some of our meat in ziplocks to be used sooner. If the bags end up failing miserably in the long run, I’ll have to update, but here’s some comparison pictures after 2 1/2 m0nths. Our feed averaged about $23 for a 100 lb bag (including tax) this year, so $300 of feed. $440 for 225 lbs in the freezer = $1.95/lb. Plus packaging (although when I buy at the store I still have some packaging costs), scraps, electric, water, time for their care and processing, seasonings and spices for the sausage, bacon, and brined roasts, wear on the pig pen, wormer (didn’t use this year), etc. Wegman’s (where we would probably buy otherwise) club pack price is currently priced at $2.98/lb for boneless pork chops, $1.49 for bone-in shoulder blade roast, $2.79 tender loin, $1.99 whole loin, $3.49 for country style ribs, $4.49 for bone in chops, $3.99 for ground pork or jimmy dean sausage, $4.99 for bacon. I usually stock my meats when I find them on sale, so I wouldn’t often pay most of these prices, but it’s a comparison none the less. See my previous posts from last year to learn more about our pig tractor, specifics of what we did for sausage, bacon, and brined roasts/ham. We’ve raised pigs in our pig tractor this year. Once they’re full grown, what have we done with them? The very first pig we butchered made his way to a pig roast. For that pig, we (meaning my dad and husband) scalded and scraped it to be roasted whole. 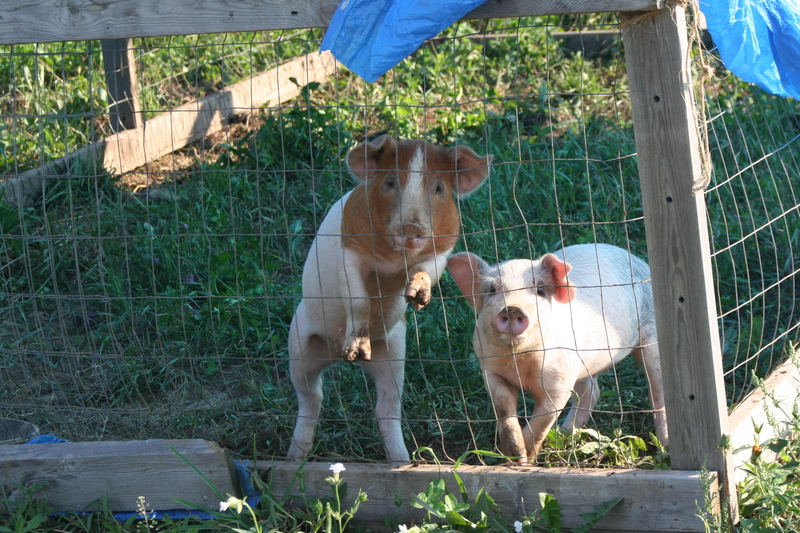 The second pig we processed ourselves in the fall, and the third pig we just processed earlier this month (January). 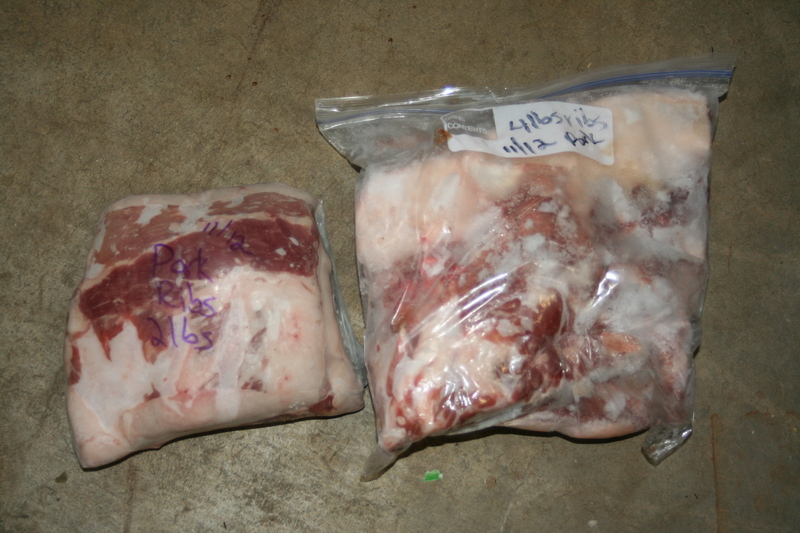 Here’s a bit more on how we as relative beginners have been processing our pork at home. We’re fortunate to have helpful and fairly knowledgable family, some past experience with deer (my husband) and general farm animal processing (my family), and the internet to fill in the gaps! I’m breaking this up into several posts so the information isn’t as overwhelming, especially if you’re just looking for one part. Here’s the “index” for what I’m adding right now, and I’ll throw in links for the pig tractor/pastured pigs, too. Pig tractor post 2– how it faired being used over the course of about 7 months- late spring, summer, and fall. A few end notes on how the tractor faired into the winter is in my post here. We processed our last pig of the year (or maybe I should say the first of this year?) on Saturday, let it hang for the weekend and cut it up Monday. 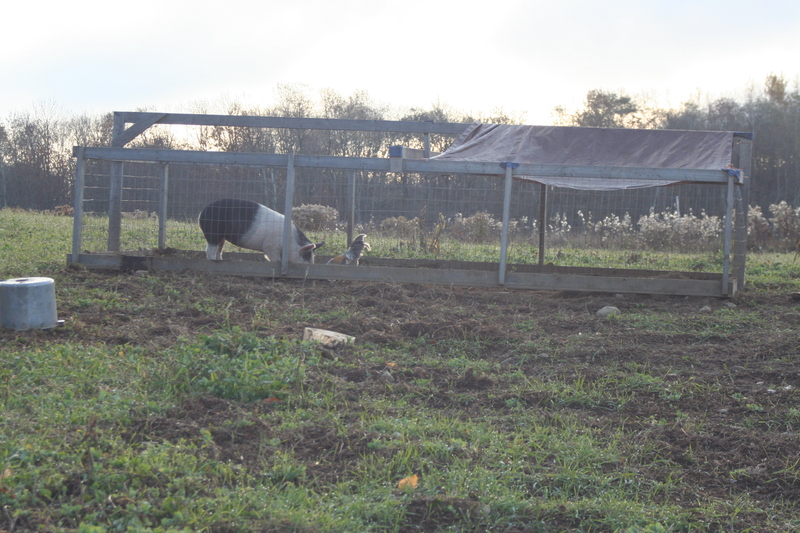 An update on the pig tractor– it’s functioned well. I’ve been happy with it and we’ll use it for this summer, and plan to really get the wheels on for this year. It was a mild winter so far, so other than getting really muddy, we had no problems keeping the pig in the tractor into January. A pile of hay to snuggle in and a tarp that inclosed much of the tractor worked well. That mud was the only challenge. I did move it a couple times when it got bad and wasn’t frozen to the ground, but its a much bigger challenge to move with mud. I’m still working to find a good ham and bacon recipe, so I’m not going to share any of those yet. I will share the breakfast sausage recipe we’ve tried and like. mix spices, mix into pork evenly, and form into patties. Saute 5 minutes each side/to 160 internal temp. I’ve used this a few times, one pound at a time as well as 5-10 pound batches. I found it on Allrecipes.com; there it’s portioned for 2 lbs at a time. Click here to go to the original recipe. A few notes: add a touch more red pepper or cayenne for a hotter sausage, if you so desire. If the ham or bacon works better for me this time, I’ll share those recipes later. We’ve pasture raised some pigs this year, and built a pig tractor in the spring. The initial post about it is here. I get pretty regular hits on this post, and I said I’d give an update, so here it is. We’ve had this pen in use for 6 1/2 months- since just after Easter. At some point I may try to get some figures posted of what our costs, feed use, and yields were, but that’s a different topic. Here’s then and now pics. The pen has held up fairly well. The pigs scratch themselves on the wire, so it looks like this now. 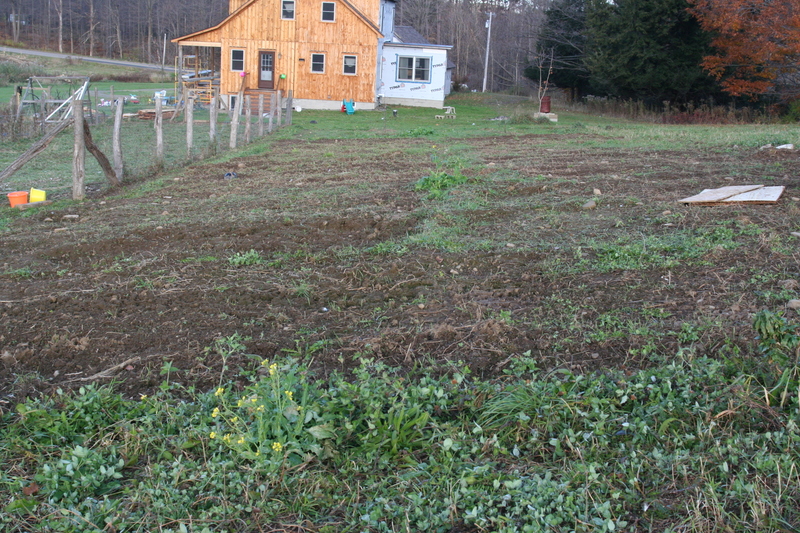 Other than that (and being dirty) it looks like it did when we started in the spring. We’ll use it again next year. I might make it with the hog panels instead of a roll of wire if I were going to do it again. We’ve replaced the tarp once, but we use secondhand tarps, and we’re in a windy location. Once the tarp is in reach, the pigs will tear at it. Except for early spring, we’ve just had the tarp over the top for rain cover and shade. We’ve kept two pigs at a time in the tractor. The first pig reached 250 pounds, the second 200. The last pig we have in it now is probably around 100 pounds right now. None of them have ever tried to lift up the pen or sneak underneath, even with a gap at ground level from an old wallowing hole. We never did get the wheels put on, so it’s been a lift and move operation the whole time, and I do it by myself. I move it sideways and it takes going back and forth to opposite ends a couple times, but it’s not too terrible. Only on the muddy, rainy days. I have almost always moved it every day, except when the pigs were very small, and now that I’ve only got one smaller pig and there’s not much vegetation growing. Not moving it now lets me keep some hay in it for the pig to keep warm on the colder nights we’re having. 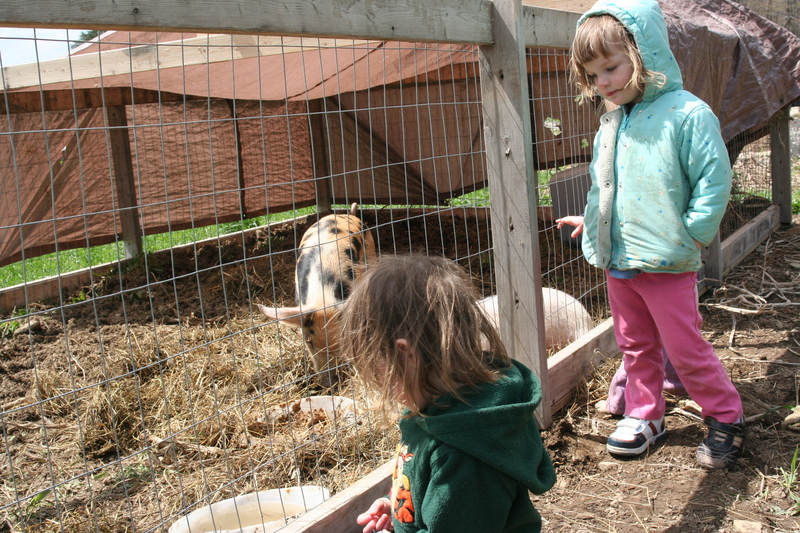 We’ll keep this last pig as long as it seems feasible with the weather. 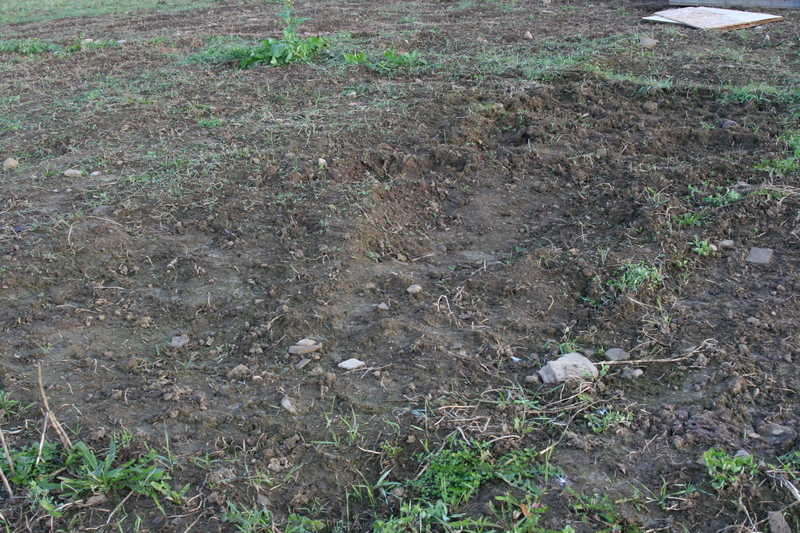 The yard where we’ve pastured the pigs is not perfectly smooth anymore. It’s mildly bumpy except for a few places where we had rainy days that everything gets muddy or super hot ones and the pigs made wallows for themselves. They do usually root up most of the area, but it’s rooted fairly evenly. They will graze the area first and then root for goodies- worms I think. They like the tops of weeds particularly well, but leave most of the grass rhizomes and roots. I tried a few times to rake it flat again, but you have to do it right away. If it rains, it’s much more difficult. We made a lot of passes over the same area and found that vegetation grew back pretty well, except during a dry spell and now that it’s fall things aren’t growing much anymore. There is no opening to get in and out of (myself or the pigs). I’ve always climbed over the side if I needed to get in the pen. To get the pigs out, we put a divider in to keep the smaller pig on one end and shot the pig we were processing, then lifted the pen up over the dead pig. 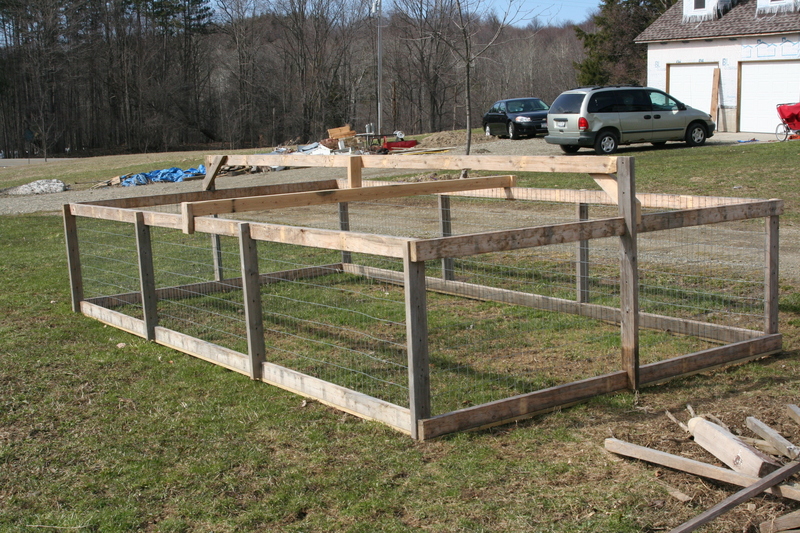 Be aware a smaller pig can jump fairly high, so that divider needs to be full height. If you’re going to haul the pig live, you’ll have to modify a bit. We had thought of undoing the wire and putting the pig into a crate or temporary cage, but didn’t need to. 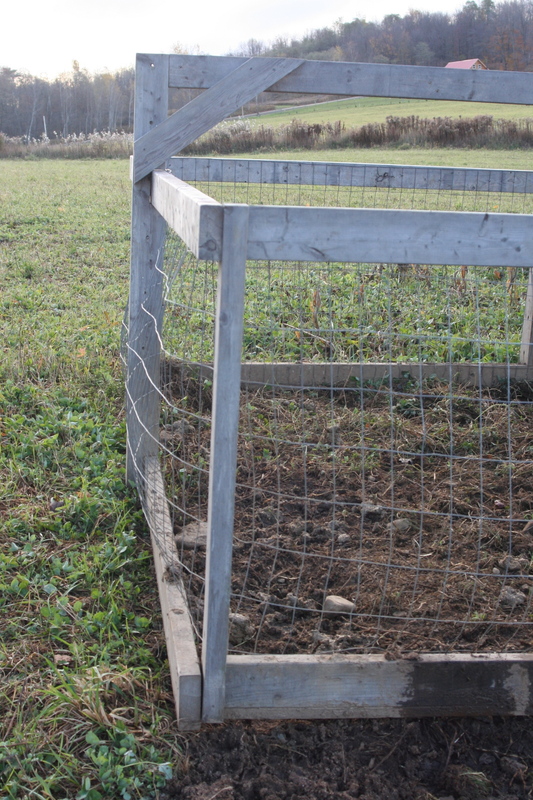 We started our pen quite a while ago in anticipation of getting a few pigs this year. Updates on how the pen has fared over here. I haven’t gotten my Old Spot yet, and I’m not sure if I will, that’s yet to be determined, I guess. But in the mean time, I did get two other pigs. The spotted pig is doing wonderfully- huge compared to the photo I have from 2 weeks ago. He eats and scratches and grunts and sleeps, that’s about it. I’d had some suggestions for names from friends, but I think I’ll be taking my brother-in-law’s suggestion of Chester. 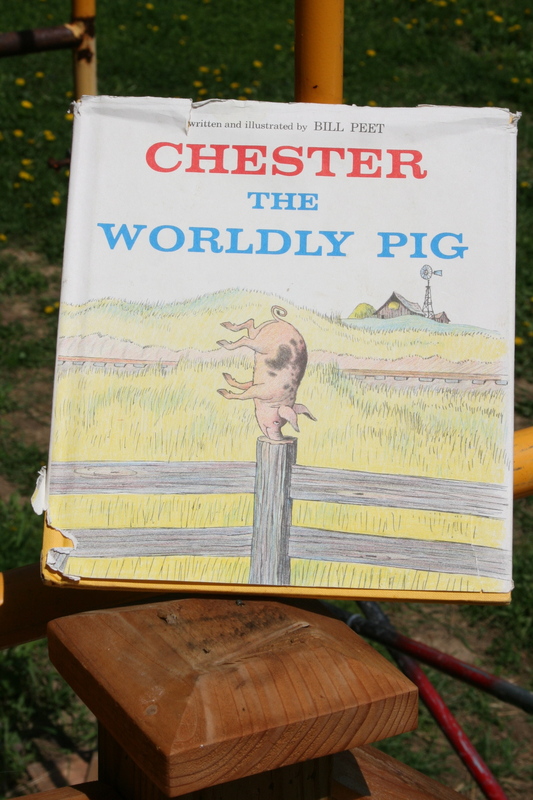 Not because I love the name, but because we have a book about a spotted pig named Chester, and it seems to fit. 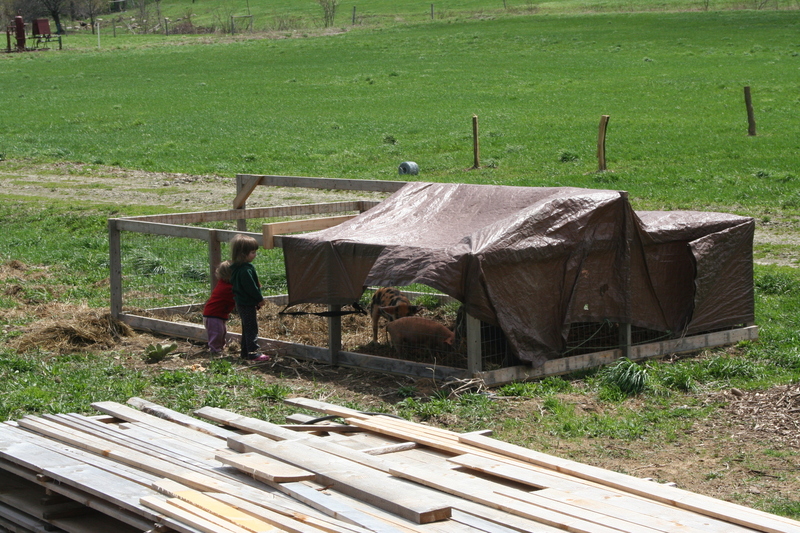 The girls have been having a wonderful time watching the pigs and pulling up grass to throw in and “feed” them. 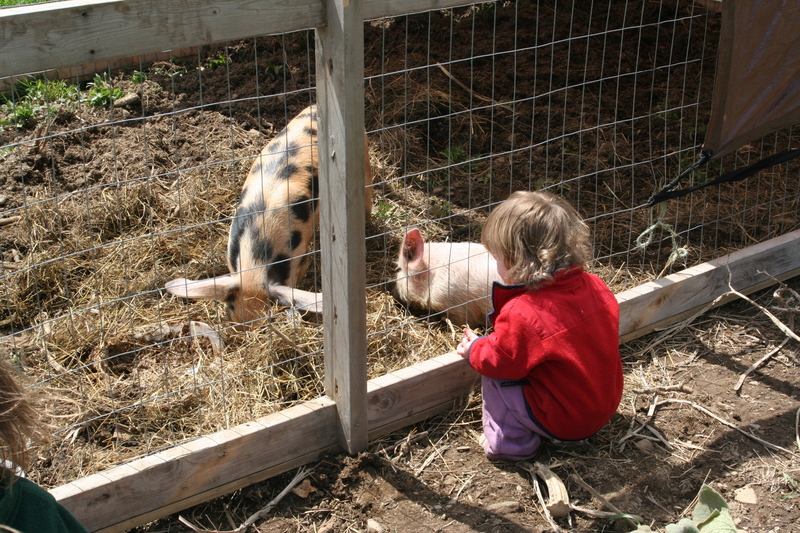 I think they could sit and watch those piggies all day!